Businesses are under huge pressure to streamline operations, exceed changing consumer demand patterns and simultaneously slim-down budgets. Here’s how you can tell if your current warehouse management software is helping you achieve these requirements. In today’s ultra competitive environment, companies are competing and differentiating themselves via their supply chains. A core component to successful execution and optimal customer service is a warehouse management system. The right WMS should help you streamline your operations in a way that helps you achieve your business goals. Trends like omnichannel are rapidly changing your customer expectations and fulfillment requirements. To exceed these customer expectations, you need a system that can handle the varying customer order requirements and ensure seamless customer order fulfillment. Are you working on an outdated, isolated WMS infrastructure? In the modern distribution environment, you can’t afford to operate in silos. If you’re falling into this trap, you need to adjust your warehouse management process to improve your service levels and streamline your operations. Great warehouse software not only fulfils your current needs, but is flexible and scalable for future growth. It must allow accurate inventory monitoring, full integration, real-time execution, and optimisation. Does Your Warehouse Management Software Suit Your Needs? Does it meet your business goals? You wouldn’t buy a sports car to transport crates of meat, the vehicle isn’t fit for purpose. Instead of making a single delivery in a truck, you’d be driving back and forth a hundred times to fill your order - costing you time and money. The same logic applies to your WMS. If it doesn’t align with your business goals, it won’t be able to deliver the results you need. In the figure above, you’ll see a dot in the centre of the triangle. 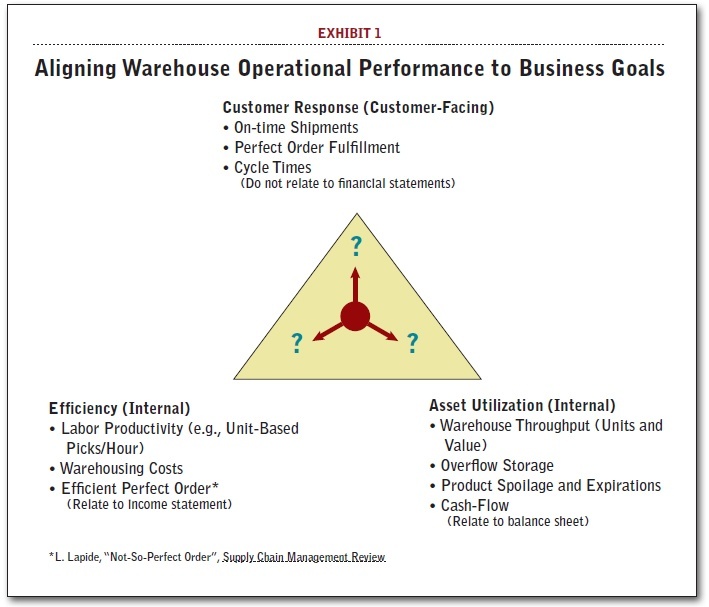 This, according to Dr Larry Lapide (MIT research affiliate and lecturer in business forecasting), “represents the balanced focus among three types of operational performance objectives: efficiency, asset utilization, and customer response.” By determining balanced performance objectives in line with your overall corporate strategy, you’ll achieve a world-class supply chain. No matter how your product is shipped, distributed, purchased, or delivered, your warehouse management software must integrate with your existing systems. It should produce accurate data for optimisation, and consolidate your inventory across multiple locations. It also needs to be able to handle different order volumes in line with varying customer order requirements, giving you the flexibility to give your customers fast, accurate service delivery. Can it reduce expenses on labour and storage? An efficient and productive warehouse is a profitable one. One of the ways that your WMS should be helping you achieve your business goals, is to streamline operations and ultimately reduce your expenses - increasing your profit margin. Warehouse Management and Labour Management Software can help save customers at a minimum 6 - 9% on labour. Manhattan’s labour scheduling solution is the first of its kinds built by distribution experts, using real-world distribution test cases and optimised for the unique and complex needs of distribution centers. Can you implement it without any modifications? Your WMS should be as simple and user-friendly to implement as possible. It should give you all the functionality you need, without having to get a software engineer to modify the system to suit your business. Is your vendor going to be a good partner for the next 10-15 years? Investing in a WMS is a big decision. The average onboarding process can take six to eight months - and you don’t want to go through all of that, only to find out at the end of the process that your vendor doesn’t provide the ongoing support you need to get the most out of your WMS. One of the best ways to tell if your vendor is going to be a good long-term partner, is to ask whether they invest back into their products. With the rapid evolution of technology, you want to make sure you’re using best-in-class software (with regularly updated functionality), to keep up with changes in the market. Take a look at how Manhattan Associates is bringing warehouse management and labour management solutions together with DM Mobile. Does your vendor have excellent local delivery capabilities? Modern buyers want instant results - otherwise they’ll simply take their business elsewhere. Gone are the days where you can afford to have a two to three month delivery cycle for functional changes to meet changing requirements. These need to be done within hours or days. Your customers expect to be able to make their purchase and receive their order rapidly and you need to be able to deliver. Read how our client, the Foschini Group, achieved this and won three major logistics awards using the Manhattan WMS. Does your WMS integrate easily with your current warehouse systems? Integrating certain warehouse management systems with your existing ERP systems and processes can be a nightmare. To avoid this, you should choose a WMS that’s known to integrate easily with other systems and software. If you have determined that a warehouse management system is ideal for you and you are ready to start the implementation process, you may want to read our article "How to prepare for a successful warehouse management system." Is your WMS providing measurable long-term ROI? Apart from the immediate benefits of a WMS (like faster picking and better inventory visibility and control), your WMS should deliver long-term ROI based on the data and insights your WMS provides. This data is invaluable. It can be used to direct your corporate strategy, identify bleeding points in your supply chain and alert you to opportunities for growth and improvement. Read our post, A guide to justifying the ROI on a WMS, to find out how to quantify the value your WMS adds to your business. If the answer to any of the above questions is ‘no’. . .
Supply Chain Junction (in partnership with Manhattan Associates) provides best-in-class warehouse and order management systems. Our mission is to enable you to improve your warehouse productivity and efficiency, in line with your business goals. Need help benchmarking your warehouse operations? Our benchmarking checklist can guide you through this process.